Known far and wide, Melchior’s is the place to go for all of your exotic taste needs. Meats and eggs, foreign and domestic, and possibly illicit, can be found, cut, seasoned, and cooked to taste. Bon appétite! Since deciding I wanted to write for Pathfinder, I realized I picked a rough time to start. Twins kids turning two and a pregnant wife that is on bed rest make for a very busy life. Trying to keep up with work and family while blogging makes my time to find writing opportunities hard to come by. I found out about an open call this past Friday, only to see that it closed the following Monday. I started writing down some notes, but could not find the time to clean them up to fit the turnover requirements. Lucky you! 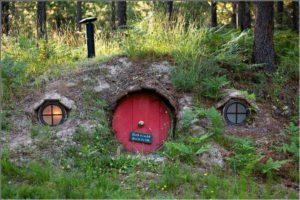 At first glance, this building appears to be a hobbit hole of some sort. Rising only a couple feet above the ground, this wide, squat building is completely covered by an enclosed grassy yard containing a variety of goats and sheep. Trees along the perimeter of the fence grow up and over the yard, maintaining a shady canopy during most hours of the day. Upon approaching the entrance, it becomes apparent that stairs lead sharply down 15 ft., and that this building is actually tall and built into the ground. What looked like a small door is simply a stylized window made to look like a door traditionally found in halfling communities, with the name Melchior worked into the glass along with a wizard’s arcane mark. The real door is a solid, heavy, iron affair with no physical markings other than a handle. Opening the second door reveals a single large room, roughly 50 ft. by 50 ft., slightly domed in the center, with a number of stone columns supporting what appears to be a stone ceiling. The air is bone chillingly cold and anybody inside without properly warm clothing would certainly succumb given enough exposure. Long thin two-tiered shelves create aisles about three feet wide. Made out of what appears to be polished steel, these shelves are all pristinely clean and have a shelf at two feet off the ground as well as a shelf four feet off the ground. Hanging above each of these shelves are a staggering array of cuts of meat. From legs to flanks to wings and more, they range in size from whole small game hens to a complete boar, with many creatures and cuts unrecognizable. At each end of the shelves, labels written in draconic identify the meats while glowing outlines of the creatures can also be seen etched in the ceiling some 15 ft. above. Placed strategically throughout the room are a series of crystals that emit a soft blue glow, ensuring that the entire place has enough light to see, but just barely. At the opposite end of the room from the entrance, is a 15 ft. wide counter that sits two feet off the ground. Behind it, can be seen a halfling busily preparing or packaging an order of some sort. Behind the counter, appears to be a ladder leading down. 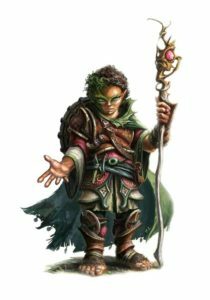 Melchior, a halfling wizard of indiscernible age, gender, and heritage, has operated in this location for over fifteen years since retiring from academia as a professor of both magic and the culinary arts. Decades, perhaps a century or more, of studying the arcane arts has led them around the world and back, many times over. As any self respecting halfling would, they sampled as much of the food they came across as possible. Realizing that cooking was just as complicated and rewarding as brewing potions or creating magical trinkets, they began to collect recipes just as they did spells. During that time, they picked up a great many habits and quirks from the chefs and cooks they found endearing, and felt that true immersion was the key to duplicating any recipe. This has only added to the eccentricities already present in any wizard that has lived long beyond their natural years. They know this, and delight in the added aura of mystery already surrounding a business such as theirs. Trip after trip, vacation after vacation, recipe after recipe, the most frequent question Melchior received was “Have you very tried <insert rare or intelligent creature here>?” One day, after learning a recipe for “owlbear stew” that was really just boar with an odd combination of spices and nuts from the forest, their vision for the Mystical Meat Emporium was born. Using a combination of divination, transmutation, and illusion magic along with several lifetimes worth of chefromancy, they were able to figure out what various types of meats *should* taste like so that they could provide these meats to customers that dare to eat the unthinkable. While they mostly deal with aristocracy and nobility, a large number of adventurer’s are also known to purchase goods from the Emporium. Nobody knows what happens in the basement below the main room, and nobody has ever seen Melchior outside the building. They mostly employ travelers or vagrants, which means they are constantly hiring new help, adding tales that some of the meat is people. Melchior has been called anything from a witch to a demon to a vampire and worse. Regardless of the accusations and pronouncements of wrong doing, business is always steady and they simply enjoy the free publicity that these rumors provide. Each of the following rumors can be learned by spending an hour or more gathering information from locals. The DC listed is the target DC to determine if the rumor is true (T) or false (F), or nobody knows (?). DC 10 – (F) Melchior doesn’t exist and the building is really haunted. DC 10 – (T) The goats and sheep are a source of meat for the emporium. 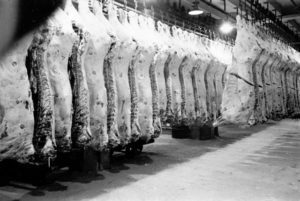 DC 15 – (F) Melchior kills employees and uses them as meat. DC 15 – (T) The grassy knoll and trees mimic the style of home where Melchior grew up. DC 20 – (F) Melchior has helped criminals dispose of bodies. DC 20 – (T) Melchior will provide in home dining experiences for the right price. DC 25 – (?) Melchior is their true name. DC 30 – (?) Melchior is hiding from their past. Tune in next time when I provide stats for Melchior and the Emporium!